2019 is officially underway, and we're already seeing some strong discounts on gaming laptops to kick your year off in style. 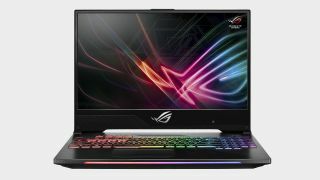 Right now Walmart has Asus' ROG Strix Hero II for $1,189.99, a full $310 off the list price. With graphics powered by a 6GB GTX 1060, the Hero II also sports a very handy Core i7-8750H that will shrug off all but the most demanding home and office workload tasks. For gaming on the go, particularly if you're a fan of MOBAs, MMOs, or Fortnite, the 144Hz display with its slender little bezel is an extremely nice feature, the sort of high refresh rate you want smoothing out less demanding games. It's also got an RGB lightbar and gaming keyboard if you value a little flash in your portable gaming experience, and it comes with a free copy of last year's excellent entry in the Call of Duty franchise, Black Ops 4. It's a fantastic little package that for close to $1,000 is a very strong bargain. If you're looking for a full size PC to ring in 2019 in style, be sure to scoot over to our best gaming PC roundup, of if you're looking for a mouse to get the most out of your laptop gaming experience, check out our best gaming mouse feature. Similarly specced laptops from other manufacturers generally land right around the Hero II's $1,500 MSRP, so you're getting a competitive laptop at a genuine discount, not a false discount from an inflated list price. It's not an insanely powerful machine, of course, but it is very well outfitted for the price, and has the advantage of being built to handle both serious multitasking as well as gaming applications.